AN award-winning American choir are performing two free concerts in Andalucia as part of their first tour of Spain which also includes performances in Madrid and Barcelona. The concerts are by the Harvard-Westlake Chamber Singers from California, USA. At 9pm on April 5 they performing in Cordoba at the Iglesia San José del Convento de San Cayetano, Cuesta de San Cayetano 8, Avenida Oyerais II with a programme of Classical music by Mozart, Victoria and Busto, Classical American Music, Gospels, Spirituals and Traditional Spanish Music. And on Thursday April 7 they are at the Iglesia del Santo Angel, Calle Rioja 23, Seville from 8.30pm. The programme will include Sacred and Classical music by Mozart, Victoria and Busto, Classical American Music, Gospels and Spirituals. Established with the merger in 1991 of Harvard School for Boys and Westlake School for Girls, the Harvard-Westlake Chamber Singers have maintained a sterling reputation for vocal excellence throughout Southern California. 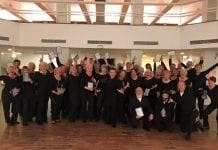 Performing in four major concerts annually, the choir’s repertoire is varied and difficult. 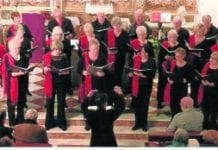 In the past six years alone, the choir has performed renowned choral/orchestral music from the great masters such as Bach’s Komm Jesu, Komm, Howard Hanson’s Song of Democracy, Britten’s A Ceremony of Carols, Handel’s Coronation Anthem #2, Vaughan Williams’ An Oxford Elegy, Randall Thompson’s Frostiana, Mozart’s Vesperae Solennes di Confessore and Regina Coeli, K. 276, Haydn’s Te Deum, Schubert’s Mass in G, Rutter’s Gloria, and the Chichester Psalms of Bernstein. The choir specialises, however, in performances of 20th and 21st century octavos from American composers such as David N. Childs, René Clausen, Morten Lauridsen, Eric Whitacre, and Robert H. Young, among others. In the past fourteen years, the Chamber Singers have toured California, Eastern Canada, Hawaii, the Pacific Northwest, Great Britain, France, Italy, Austria, the Czech Republic, throughout the Southern, Midwestern and Eastern United States, Denmark, Sweden and Estonia. The choir has been featured in performances at Carnegie Hall, St. Martin in the Fields, the American Church in Paris, the Académie Gabriel Fauré de Louveciennes, The Cathedral of Our Lady of the Angels, and with the Los Angeles Jewish Symphony. Honours and awards at festivals and competitions are numerous for the choir including highest honors at the Evergreen/Mt. View Invitational Festival in Vancouver, Washington; first place awards in division I in both performance and sight singing as well as grand champions at the Riverside Choralfest of Southern California in both 1997 and 2002; Large Division Champions at the California Golden State Choral Competition-South in 2003; 2006 Grand Champions at the Heritage Festival in San Francisco, and 2010 Grand Champions at the Heritage Festival of Gold National Choral Competition. The Harvard-Westlake Chamber Singers have never earned less than a Superior rating in eleven years of participating in Southern California Vocal Association choral festivals. Finally, the Chamber Singers were featured in performances for the 1997 California Music Educators Association State Convention, 2000 and 2010 ACDA Western Division Conventions, and the 2005 ACDA National Convention.